The monster Michael Myers is back and with him comes the impossible expectations of living up to the iconic and damn near perfect first film. I remember the first time I saw Halloween II, I was far more critical of its missteps then I am today. Part of the problem for me was that this serves as a direct continuation of the events of the original, literally starting off with the previous ending unfolding all over again, so I felt like I should judge it as almost another act of the same product rather than what it is: an inferior sequel that wasn't even directed by the same man, John Carpenter. Sure, he wrote the film and he did a fine job, but it was obviously going to be an extreme challenge to try to match or improve upon such a tremendous achievement in horror. I don't know this to be fact, but I assume even Carpenter would have recognized those impossible odds and perhaps that is even why he didn't return to helm the picture. Something about the tone of Halloween II was both fitting for this film and what it was trying to accomplish yet still lacking a bit of what made the first so memorable and brilliant. Despite all the terror going on in the shadows of night during the original Halloween, the scenes that haunt me more than anything are the moments Myers stalks Laurie during the day time after school. There is something about having the epitome of evil lurking outdoors in plain sight in the middle of the afternoon that I found to be so ingeniously handled, and that is missing here but with good reason. 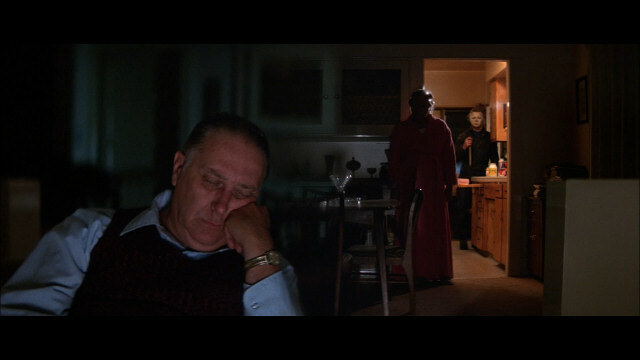 In Halloween II it is more about the aftermath of the killings, what a small quiet town would look like once it becomes clear that a murderer is on the loose. Fear and chaos rather than the calm that comes with the assumption of safety. So after repeated viewings it became obvious that in order to enjoy Halloween II I would have to accept that it never had a chance to truly feel like a direct continuation of the first in every way. From Donald Pleasence seeming a little more hammy and ridiculous with his performance to the setting, characters and circumstances being a bit less compelling this time around, the sequel just isn't the masterpiece that Carpenter had crafted to kick off the franchise. It never had a chance to be. What it is, at the end of the day, is a really good and enjoyable film involving my favorite horror villain of all time. Had a blast sitting down on a rainy Halloween afternoon and soaking in the blissful bloodiness of a hectic Haddonfield, Illinois. I actually really enjoyed the recent remake of the first Halloween by Rob Zombie. He has a bizzare love of horror. His sequel remake didn't wow me as much. My issue with the Zombie remake was the back story given to Myers, doing whole abused childhood thing. I felt oddly sympathetic for him when, while watching the original by Carpenter, it is pure horror watching this monster walk the streets. I don't want to feel sympathy for the people behind the mask, it ruins the terror aspect.